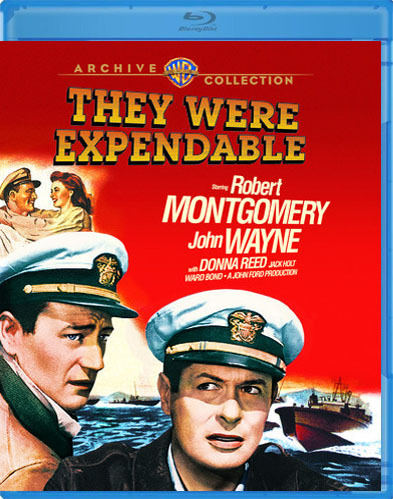 Two of the greatest films from director John Ford and star John Wayne have recently been released on Blu-ray by the Warner Archive: THEY WERE EXPENDABLE (1945) and SHE WORE A YELLOW RIBBON (1949). THEY WERE EXPENDABLE (1945) is possibly the greatest war film ever made, and SHE WORE A YELLOW RIBBON (1949) is my all-time favorite Western. The Warner Archive couldn't have made better choices to release on Blu-ray, and the resulting discs provide a wonderful viewing experience. Both films look terrific, with SHE WORE A YELLOW RIBBON deserving particular kudos as one of the best-looking Blu-rays I've ever watched. THEY WERE EXPENDABLE was originally reviewed here in 2014, at which time I also provided quite a bit of background on the making of the movie. Inspired by actual people and events, it's the story of a PT boat squadron stationed in the Phillipines in the early days of WWII, when the war's outcome was far from certain. 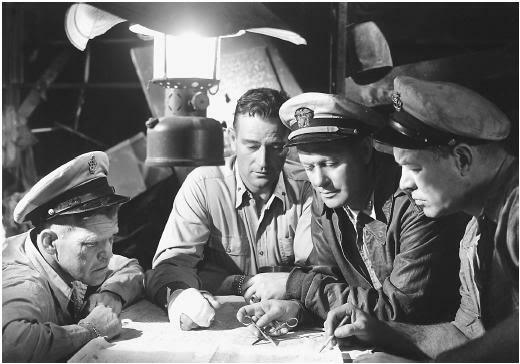 Robert Montgomery, who also filled in as director when Ford was incapacitated, stars as Lt. John Brickley, with Wayne costarring as Lt. Rusty Ryan. Their squadron attacks Japanese boats but as the situation in the South Pacific deteriorates, they must evacuate General MacArthur from Bataan; Brickley and Ryan will eventually leave themselves, in order to train future PT boat crews. The rest of the squadron must be left behind to face the advancing Japanese. THEY WERE EXPENDABLE is a long film at 135 minutes, but every minute is deserved. It's a powerful film about heroism under the most difficult conditions. 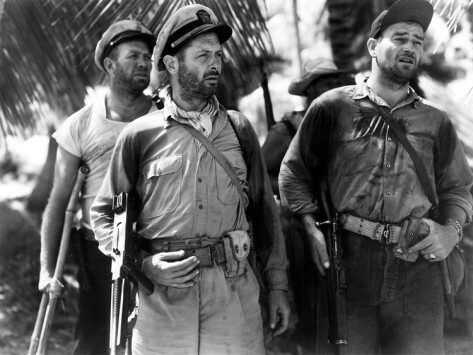 There are countless memorable scenes, including several officers hosting a glowing young nurse (Donna Reed) for dinner, but for me the most haunting moment comes at the end, when two men (Leon Ames and Louis Jean Heydt) graciously accept being bumped from the last plane off the island in favor of two young PT boat officers (Cameron Mitchell and Marshall Thompson). Everyone knows that the two men will likely become prisoners or be killed, but all involved, especially the men themselves, act with complete class. It's unforgettable...but then so is the entire film, a remarkable mixture of grit and poetry. It should not be missed. 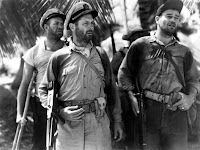 Ward Bond, Jack Holt, Russell Simpson, Paul Langton, Donald Curtis, Jack Pennick, and Jeff York are among the large cast. It was shot by Joseph H. August. The screenplay by Frank Wead was based on a book by William L. White. 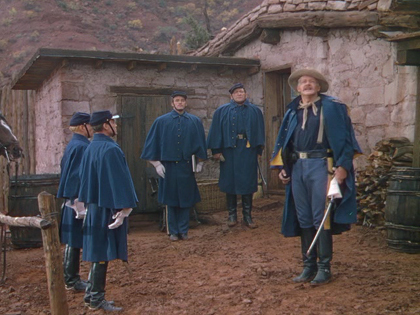 As with THEY WERE EXPENDABLE, it's hard for me to do anything but heap superlatives on SHE WORE A YELLOW RIBBON. Last fall I reviewed SHE WORE A YELLOW RIBBON after seeing it in 35mm at UCLA. Just a few months later I had the chance to see the film again in a digital presentation at last spring's TCM Classic Film Festival, an experience which confirmed that YELLOW RIBBON will always be a good choice for me. That was certainly underscored watching the Blu-ray, my third time to see the movie in a year's time! It's simply not a movie I can see too often. Incidentally, my understanding is the Blu-ray is the same restored digital print I saw at the TCM Festival. 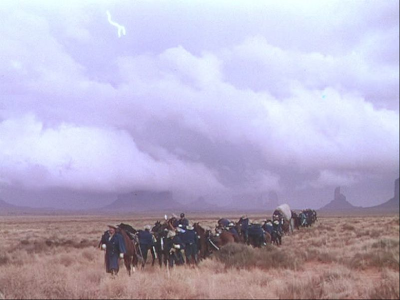 SHE WORE A YELLOW RIBBON is a seemingly simple tale, with much of the film following a group of soldiers traveling through Monument Valley in a big circle, but one of the marks of a great film is finding new details on every viewing. That's certainly been the case for me. This time around, thanks to the clarity of the Blu-ray, I especially noticed the way the breath of both men and horses is seen on screen in an early morning scene. Later, in the storm sequence, one would swear you could almost feel the wind whipping up and smell the impending rain. The immediacy of these scenes, decades after they were shot, is amazing. The movie contains my favorite Wayne performance as the about-to-retire Captain Nathan Brittles, with Ben Johnson also especially memorable as Sgt. Tyree. Johnson's beautiful horse, Steel, was owned by his father-in-law and was considered to be one of the greatest horses in movie history. 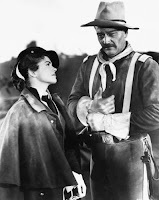 The film is a wonderful showcase for the Ford Stock Company, including George O'Brien, Mildred Natwick, Victor MacLaglen, Arthur Shields, Harry Carey Jr., Joanne Dru, John Agar, Francis Ford, and Jack Pennick. It's a thing of beauty watching a cast like this making magic together. Speaking of beauty, this is perhaps the most gorgeous Western ever filmed, thanks to the Oscar-winning work of Winton Hoch. Beyond the famous storm scene, which Hoch filmed under protest and which undoubtedly led to his Academy Award, the blues and yellows of the uniforms against the red-orange of Monument Valley is simply stunning. The film has surely never looked better than it does on this Blu-ray. 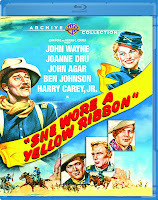 SHE WORE A YELLOW RIBBON is 104 minutes long. The screenplay was by Frank Nugent and Laurence Stallings. Each of these Ford/Wayne Blu-rays contains the trailer, and the YELLOW RIBBON Blu-ray also includes brief home movies of Ford and Wayne on a location scouting trip in Mexico. The home movies were also included in a previous DVD release. Both Blu-rays receive my highest recommendation. Thanks to the Warner Archive for providing review copies of these Blu-rays. 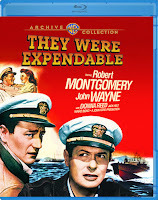 Warner Archive Blu-rays may be ordered at the Warner Archive website.